Rough winter. No worries, it’s all green! Cilantro: no wonder these guys always go to seed mid-May…they were happy as clams through the winter and are going strong in the covered beds right now. I love to toss a few sprigs in with my salads, adds a nice contrast. Cress: whoo-wee, spicy — but so good! And one of the loveliest rows in my raised beds. Toss them all together with just about any kind of salad dressing….YUM! These salads can stand even the most outrageously bold dressing (a la roquefort or something really garlicky) and still hold their own flavor-wise. But I personally like them with a balsamic vinaigrette. 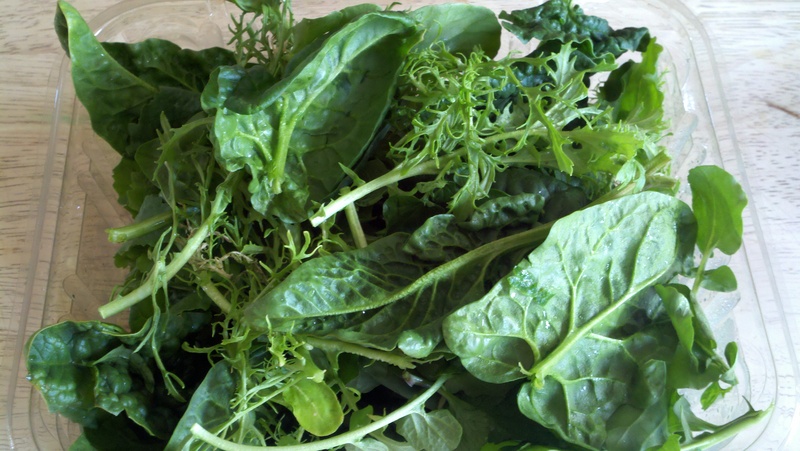 While I’m crunching away, I can’t help but think of the super vitamins I’m getting from such dark leafy veggies, especially when the toddlers are toting in all kinds of icky viruses this time of year. Hey, I have greens planted in my front yard garden in raised beds covered by hoop tunnels. Just like you! 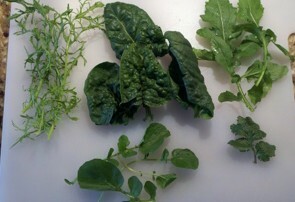 I have cress, collards, sorrel, salsify, chard, and kale. I had no idea you could grow cilantro all winter. I will try it this fall. DId you have anything else planted over the winter? Looking for more ideas that will work. spicy – give that a try and you will see. I do like the kick of cress when it’s raw but I have to mix it in with spinach to mellow it some! Let’s see, other things that overwintered: carrots, tatsoi (a little like bok choi), red mustard greens (pretty but not my fave to eat, a texture issue for me). 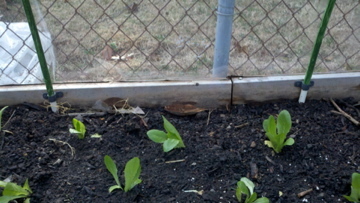 Thanks for the info on your overwintering veggies, I will try the bok choi, that sounds like winner. I also had carrots, radishes, onions. 2 days after our last snow I seeded more carrots and radishes and they are going crazy. My goal is to have as much perennial and biennial veggies as possible. So I researched and sorrel and salsify fit in there. I got seeds from Sow True and gave it a shot. Sorrel is good for salads as is salsify, the latter didn’t have enough time before winter set in but is really taking off now. I tried snow peas over winter and they almost made it but the single digits and the snow collapsed my tunnels. I used ladder blocking instead of PVC –its cheaper but you need to build supports. I did that afterwards using bamboo I had.